The VR was printed for use but not issued. 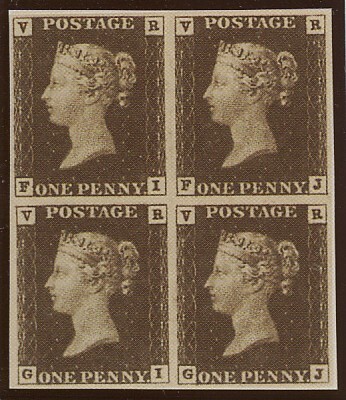 In the upper corners instead of the ‘stars’, the letters ‘VR’ appeared and it was intended that this stamp would be used for official purposes. However, the idea was shelved and apart from a small number of copies, the entire print was destroyed. This stamp had its own plate inscribed ‘A’ in all corners of the sheet. The 4 letters were struck in position by hand with a metal punch. The plate itself bears few characteristics and little study of it has, to date, been made. It is easily identified by the ‘VR’ letters. The few copies that remained were used in experiments for trial obliterators. Attempts then being made to remove the PMK with chemicals. A considerable rarity – that stamp is eagerly collected in any condition.